Yuri's Night NYC is coming up on April 10! My friend Liz Kennick is producing the whole thing, and I'm scheduled to be a special guest (I say scheduled because I'm set for surgery April 8). 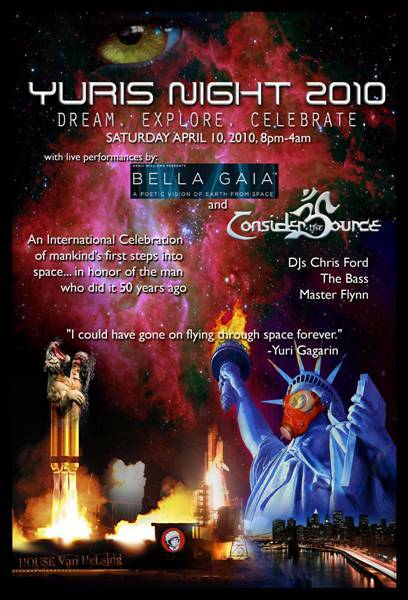 The show features a fashion show featuring space swimsuits by Keriann of 'Evening Ladies, milinery by EdithandIvy.com, space dress by Raya, and more... Kenji Williams performing BELLA GAIA with a live ensemble, Consider the Source offering live prog rock near midnight, 3 DJs, dancing, costumes, space trivia game, NY Jedi, short but amazing presentations on the latest in commercial space and using new space technology to improve conditions on Earth, from our stellar VIPs!